“Google search results for ‘Trump News’ shows only the viewing/reporting of Fake New Media. In other words, they have it RIGGED, for me & others, so that almost all stories & news is BAD, Fake CNN is prominent. Republican/Conservative & Fair Media is shut out. Illegal,” Trump said in his latest claim of bias by the media. 96% of results on “Trump News” are from National Left-Wing Media, very dangerous. 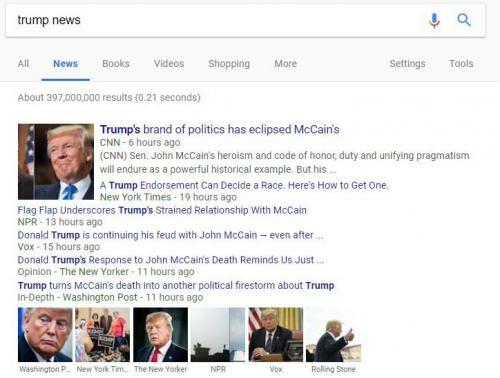 Trump may have a point: a generic search for “Trump” in Google’s news shows links to CNN, NYT, NPR, VOX, the New Yorker and Washington Post – all what are considered in that order. Then, repeating an accusation he has made previously, Trump tweeted that “Google & others are suppressing voices of Conservatives and hiding information and news that is good. They are controlling what we can & cannot see. This is a very serious situation-will be addressed!” It wasn’t clear just what this “addressing” would entail. Trump’s assault on Google follows Trump’s Aug. 24 claim that social media “giants” are “silencing millions of people.” As Twitter has recently admitted, it has indeed been shadowbanning and otherwise ghosting various conservative accounts, which has resulted in CEO Jack Dorsey being invited to testify before Congress on the company’s policies.